Want to know more about True Match by L'Oreal? Let our expert answer to a reader's question help you decide if this is the makeup for you. I would like to know if the foundation "True Match" of L'Oreal is non-comedogenic. Non-comedogenic has become a fairly common word in the makeup world. A complicated sounding term; it is plainly defined as not causing a plug of dirt and fatty material in a skin duct. In simple terms, the product will not clog your pores. This is an important feature - as no one wants their face to break out after applying a makeup product. So, most manufactures will advertise the fact on their labels and advertisements. In the case of L'Oreal's True Match foundation, they do advertise the product as an ultra-pure formula that contains no oils, fragrances or pore-clogging fillers. This statement could easily translate to hypoallergenic and non-comedogenic. Of course, if you are prone to breakouts or have particularly sensitive skin, you should take the following steps to ensure any cosmetic product will leave your skin healthy and clear - no matter what they advertise. Always wash your face well each night before bed - using a makeup remover for waterproof products. Wait a few minutes after cleansing your skin in the morning before applying your makeup. Read the instructions on makeup packages to look for warnings, cautions and general application guidelines. Check the ingredient list and research any potential problems or possible allergic reactions. In the case of True Match, they do list an ingredient that has been linked to some skin reactions. Diazolidinyl Urea is a product that is a known skin sensitizer. Although it will not clog your pores, it may cause a bumpy rash that would resemble a breakout of acne. Urea products tend to cause problems for certain individuals, so you if have had a problem with this ingredient in the past, you may want to avoid True Match. If you are unsure, simply apply a small amount on the inside of your arm. Leave it on for a few hours and wash off. Wait a day or two to see if there is any reaction - if nothing happens, you should be safe to use this foundation. I'm new to mineral makeup so I wanted to know if I can mix two different types of brands of mineral foundation together? I recently received some samples but they turned out to be too dark. I have another mineral foundation that I purchased that was to light so I thought instead of letting them go to waste maybe I could mix them together to the shade I need, but I wasn't sure if you could do that with two types of brands without getting a bad reaction on my skin? Of course you can. Most of the ingredients in makeup-whether mineral or otherwise-are pretty similar. The best thing to do is use the back of your hand to mix the two shades. That area of your hand is a very close match to the natural skin tone of your face. After dipping a large brush into the mixed shades, knock the handle of the brush lightly to remove excess, or turn the brush bristles-up and tap it lightly on the counter to settle the powder into the brush (this keeps you from applying too much powder and getting a dry or chalky look.) Apply the powder to your face. Some like to apply in circles, some glide it on in long strokes. Even if you're shooting for maximum coverage, remember that several light layers are better than one thick one. 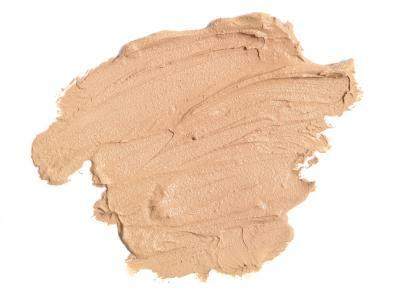 For a different look, try applying your foundation with a damp sponge.